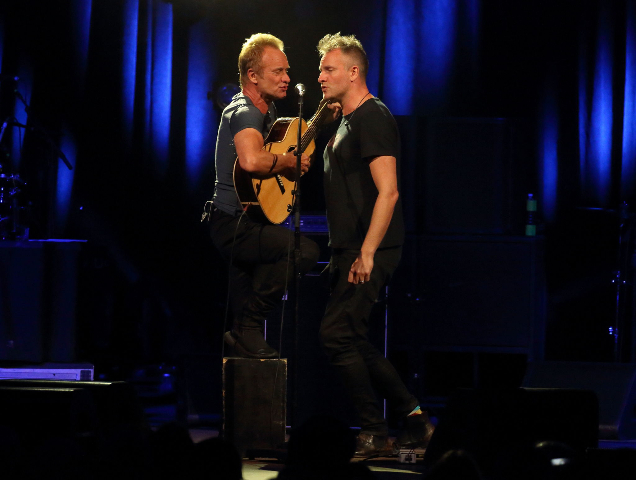 In every sense it was a cool evening in the Shed as British rock star, Sting, brought his tour in support of the album 57th and 9th to Tanglewood. They have been on the road since last February. Surisingly, sharply at 8 PM Sting bounded onto the stage. He tossed off a jacket and appeared in a monochromatic T shirt as did the rest of the musicians. Briefly greeting the audience, with one leg propped up on a stool, he leaned into an acoustic guitar offering a song from his first rock album in a decade "Heading South on the Great North Road." He brought out his son, the taller somewhat more butch, Joe Sumner, who joined him on the chorus. Telling us that he would be back late,r for the next fifteen minutes Sumner solo with electric guitar, performed several originals. Initially, the audience was quiet and attentive until he encouraged them to participate. That livened things up especially for “Two Sisters” from his work with the band Fiction Plane. He sang "You Were Looking at Me and I was Looking at You." Later in the evening he introduced "Jellybean" his first single written for his kids. The tour may well have been called Fathers and Sons. His lead guitarist of some 20 years, Dominic Miller, brought along his scruffy lad Russ who had all the chops of his old man. His licks on a classic Les Paul guitar were lean and tasty. He also provided backing vocals. The opening act Los Bandaleros from San Antonio performed a half hour set exiting at 8:45 PM. With a fifteen minute intermission they returned as part of Sting’s band. They performed on Sting's new album and one of their musicians on “squeeze box” now and then with flash and flourish traded leads with Dominic. 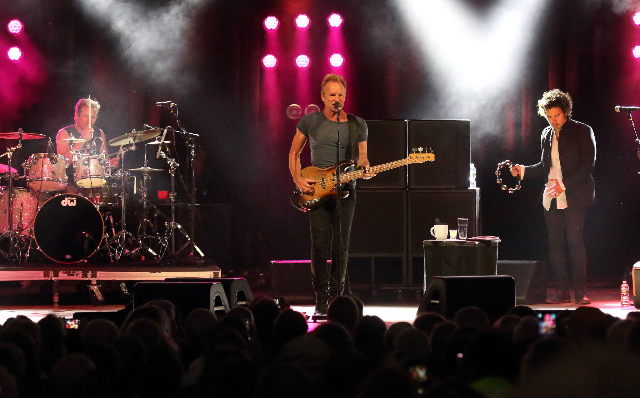 Sting was planted dead center on the wide stage which was continually bathed with dramatic lighting to evoke the shifting moods from rockers to ballads. 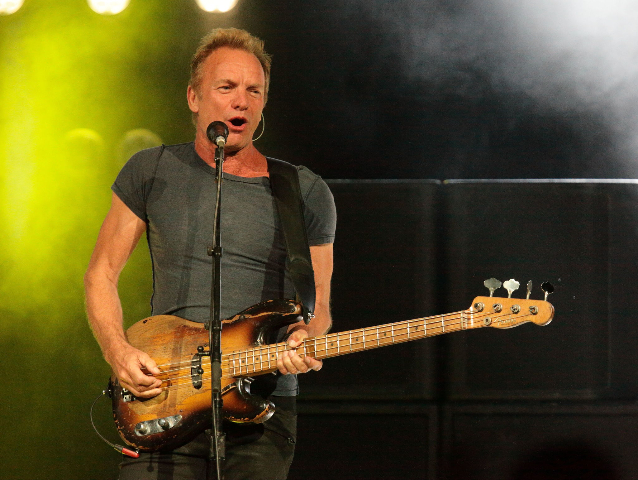 The sound mix was interesting as Sting’s bass was cranked up so much that it rattled me timbers. Usually bass drops in under the lead and rhythm guitars. It is most unusual for a rock star to play bass. The other example, of course, is Paul McCartney. The third great rock bass player was John Entwhistle of the Who. They called him The Ox but he had none or the charisma of Sting or Paul. He was more like Bill Wyman of the Stones who never called attention to himself. Most bass players, with these notable exceptions, are there to be heard and not seen. The fourth song “I’m and Englishman in New York” from his second d album in 1987 was particularly enticing. It’s mantra of identity and multi-nationalism is particularly relevant during the current conflicts of globalization, xenophobia and immigration . There was the familiar ska riff to “Every Little Thing She Does is Magic” with a nice change of beat from drummer Josh Freese. Which elided into “Message in a Bottle” then saying "Daddy is a little tired" his son returned with the Bowie standard “Ashes to Ashes.” Then Sting returned. Ending the set around 10:20 they kicked it up into the anthem “Roxanne.” That brought everyone up on their feet and singing along. It was stomp and roll until oddly the stage was bathed with blue light as eased down to a ballad. The audience accordingly was seated then back up when they kicked again into high energy. Followed fittingly by “Fragile” it was getting near 11PM which is curfew time in Lenox as we made our way to the car. "You haven't lost any of your "groove" as a concert reviewer. I saw Sting many years ago in a relatively small Milwaukee concert hall. This was when he was usually playing stadiums. It gave us an intimate, personal view of this great performer. Sounds like your concert - with kids filling in on vocals, guitar, etc. - was a lot of fun. It's great to see someone who has been around awhile and has oodles of material to choose from for his set list. I learned a thing or two from your review, also. Great job." "Stunningly satisfying evocation of this momentous concert for those of us who could not be there. I'm feeling a vibe almost as if I experienced it, too. Thanks, Charles."